Doctors are notorious for being labelled as ‘bad’ patients – delaying seeing their GP and presenting late for treatment are just a couple of key examples. Mental health problems, including anxiety, depression, addiction and even suicide in extreme cases, are becoming increasingly common among medics, with female doctors two and a half times more likely to commit suicide than the average woman. To investigate this trend further, independent researchers Alex Wessely and Clare Gerada conducted an anthropological study to try and analyse why doctors delay their own care, especially with regards to mental health. Why don’t doctors seek help? Firstly, Wessely and Gerada identify a number of structural barriers that prohibit doctors from getting medical attention. Shift work makes it tricky to get an appointment during working hours, whilst constant location rotations make it difficult to register to a local GP for consistent treatment, which is especially important in mental health cases. Doctors may also have trouble getting confidential care – this is of high importance to clinical professionals for fear of affecting career progression and revealing the stigma that comes with saying that you have a mental illness. It’s little wonder that after at least six years of medical training, doctors have an ingrained sense institutionalisation with their professional identity, where being a doctor becomes a key identity indicator – the notion of the ‘medical self’. This is further reinforced by the idea of a ‘vocation’, and that to join the medical profession, students need to fine tune their academic career and experiences accordingly from quite an early stage. Many doctors feel compelled to define themselves by their work, with outsiders expecting doctors to inhabit their professional role at all times, often being nagged by family and friends for extra medical advice. Wessely et al note that “The individual and the doctor become indistinguishable from each other.” Since doctors are viewed as the opposite of patients, this can make clinicians feel vulnerable to impairment and could be a reason why many do not register with a GP. Then there is the minefield of mental health stigma to negotiate. 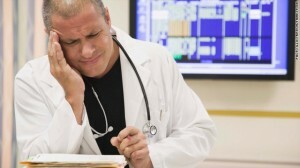 The study reports that whether consciously or unconsciously, just asking for help is translated by colleagues’ as a display of weakness, with doctors who become patients often feeling they are letting the profession down, as they are not standing by the widely held belief that doctors do not become ill themselves. Many doctors fight this by talking shop throughout consultations to try and reassert their medical self. The study concluded by saying that when doctors relinquished the medical self and embraced the role of the patient, the outcomes were actually good, with reduced distress and impairment.